In recent years, the use of the consensus definitions of acute kidney injury (RIFLE and AKIN) in the literature has increased substantially. This indicates a highly encouraging acceptance by the medical community of a unifying definition for acute kidney injury. This is a very important and positive step in the right direction. There remains some variation in how the criteria are interpreted and used in the literature, including use/nonuse of urine output criteria, use of change in estimated glomerular filtration rate rather than change in creatinine, and choice of baseline creatinine. The present review is intended to aid the reader in critically appraising studies using these consensus definitions. Since no single definition will be perfect, a logical next step would be to reconcile existing definitions, moving the medical community towards using a single consensus definition as has been done with sepsis and acute lung injury/acute respiratory distress syndrome. As new data emerge, integration of novel biomarkers into the consensus definition will be a welcome refinement. Acute kidney injury (AKI) is an important clinical issue, especially in the critical care setting. AKI has been shown in multiple studies to be a key independent risk factor for mortality, even after adjustment for demographics, severity of illness and other relevant factors . Despite recent evidence suggesting some improvement in outcomes over time [2, 3], AKI remains a formidable problem. It is a complex clinical syndrome for which there was no accepted definition for quite some time. Reported incidence and mortality rates vary widely in the literature, with incidence ranging from 1 to 31% and mortality from 28 to 82% [1, 4]. This wide variation stems not only from the diverse patient populations in the different studies, but also from the disparate criteria used to define AKI in these studies. Over 30 definitions of acute renal failure/AKI have been used in the literature. These range from looser criteria such as a 25% increase in serum creatinine from baseline to more stringent definitions such as the need for renal replacement therapy (RRT). The more permissive the definition used in a particular study, the higher the incidence of AKI and the lower the associated mortality. The reverse is true with more restrictive AKI criteria . As a result, comparison between different studies has been difficult. A unifying definition was needed to bring order to the AKI literature, in much the same way that consensus definitions for sepsis, acute respiratory distress syndrome and acute lung injury have done. After an initial attempt to stratify AKI for severity , a consensus definition was published by the Acute Dialysis Quality Initiative (ADQI) . A modified version was proposed recently by the Acute Kidney Injury Network (AKIN) . Both definitions are briefly described here, and issues relevant to their use and validation in the literature will be reviewed. This is not intended to be a systematic review as one has been recently published . Instead, the present review is intended to aid the reader in critically appraising studies using these consensus definitions. In 2004 the ADQI group published their consensus definition for AKI, the Risk–Injury–Failure–Loss–Endstage renal disease (RIFLE) classification . Being a definition, RIFLE is intended to establish the presence or absence of the clinical syndrome of AKI in a given patient or situation, and to describe the severity of this syndrome. The classification was not designed to predict mortality or adverse outcomes, although it is logical to assume that more severe disease should result in worse outcome. RIFLE uses two criteria: change in blood creatinine or glomerular filtration rate (GFR) from a baseline value, and urine flow rates per body weight over a specified time period (Figure 1). Patients are classified on the basis of the criterion that places them in the worse category. Risk is the least severe category of AKI, followed by Injury, and Failure is the most severe category. RIFLE is therefore also able to describe the change or trend in AKI severity over time. 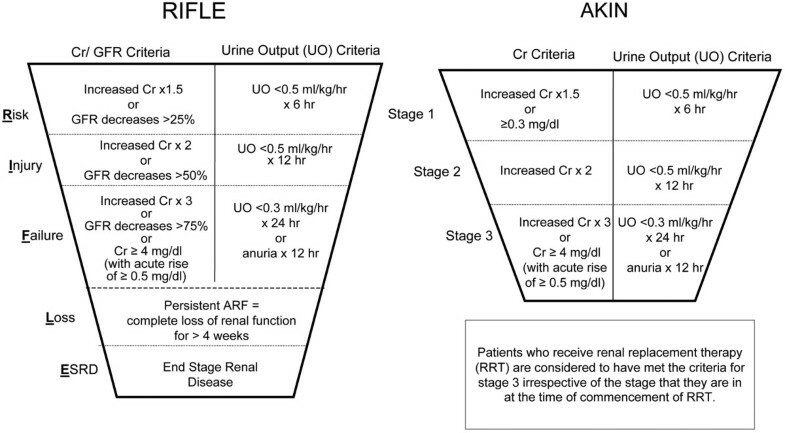 RIFLE and AKIN classifications for acute kidney injury. Risk–Injury–Failure–Loss–Endstage renal disease (RIFLE) and Acute Kidney Injury Network (AKIN) classifications for acute kidney injury (adapted from [6, 7]). ARF, acute renal failure; Cr, creatinine; GFR, glomerular filtration rate. Since the classification's publication, several original investigations using RIFLE have been published [8–32]. These studies have varying objectives, including description of the epidemiology of AKI, association between the presence and severity of AKI with clinical outcome, evaluation of biomarkers or devices for the diagnosis of AKI, and describing renal outcome. Ricci and colleagues recently published a systematic review of 24 of these studies . The majority of the studies looked at patients in general or specialized intensive care unit (ICU) settings , one study analyzed all hospital admissions over a 3-year period , while another study made a population-based estimate of AKI incidence in Scotland . Most studies were retrospective in design, and used only the creatinine/GFR criterion. In only 12% of the analyzed population were the creatinine and urine output criteria used together; furthermore, only two of the included studies were prospective in design [11, 12]. The analysis of pooled data showed a stepwise increase in relative risk for death with increasing AKI severity (Figure 2) (Risk, 2.40; Injury, 4.15; Failure, 6.37, with respect to non-AKI patients) . This biological gradient generally held true regardless of the type of patient population studied (Figure 3), with the possible exception of patients dialyzed for AKI. Two of the studies included in the systematic review looked exclusively at this population; the authors staged AKI severity at initiation of RRT. In their cohort, Bell and colleagues reported a 30-day mortality of 23.5%, 22.0% and 57.9% in patients with Risk, Injury and Failure, respectively . Maccariello and colleagues reported similar mortality in the three groups (Risk, 72%; Injury, 79%; Failure, 76%) . Mortality by RIFLE class. Mortality (relative risk (RR) and 95% confidence interval) by Risk–Injury–Failure–Loss–Endstage renal disease class (data from ). AKI, acute kidney injury. RIFLE class and mortality in different patient populations. Risk–Injury–Failure–Loss–Endstage renal disease class and mortality in different patient populations (data from ). NonAKI, no acute kidney injury; Cr, creatinine; ICU, intensive care unit; RR, relative risk. Since the e-publication of the systematic review , at least 16 new original investigations using RIFLE were published [16–31]. Among them, the largest is a retrospective analysis of over 120,000 patients evaluated on the first ICU day [15, 24]. This study again confirmed a stepwise increase in risk of death going from Risk to Injury to Failure . Overall, these studies demonstrate that the worse the RIFLE class, the higher the mortality [8–12, 15–17, 19–25, 31], the longer the ICU stay and hospital stay [15, 24, 31], and the lower renal recovery (for example, higher serum creatinine at hospital discharge) . It is important to note, however, that among a total of over 200,000 patients included in all these studies, less than 2% of patients were part of prospective studies [11, 12]. The RIFLE classification is not without its limitations. First, any clinical definition of AKI signals its presence when there has already been a decline in the GFR, whereas biomarkers are able to make the diagnosis at an earlier stage; for example, when there has been tubular damage even before there is a change in the GFR. On the other hand, biomarkers may signal damage at the molecular and cellular level that may not necessarily translate into a clinically relevant reduction in the GFR later on. Second, the use of 6-hour and 12-hour urine criteria make RIFLE unwieldy for retrospective studies, since such data are not collected as part of routine clinical practice. Not only is urine output affected by diuretic use, but such details can only be accurately assessed in patients with a urinary catheter. In addition, the urine output criterion may not match well with the patient's respective creatinine criterion. In the aforementioned systematic review, the relative risk for death among studies that used both creatinine and urine output criteria was lower than in those using the creatinine criterion only . This finding is congruent with prior observations. In a review of 10 studies, Hoste and Kellum noted that patients in the Risk class defined by the creatinine criterion were more severely ill than those in the same class defined by the urine output criterion alone . Hoste and colleagues also observed that patients in Failure based on the GFR criterion had a slightly higher mortality than those in Failure based on the urine output criterion . In a study by Cruz and colleagues, RIFLE classes (using creatinine and urine output criteria together) were the strongest predictor of ICU mortality in multivariable analysis . When the analysis was repeated based only on change in the creatinine criterion, however, RIFLE class was an independent predictor but the statistical model was inferior. When analysis was performed based only on the urine output criterion, RIFLE class did not emerge as an independent predictor. Altogether these findings highlight a potential effect of the use or nonuse of the urine output criterion on the overall predictive capacity of RIFLE in a particular study. Furthermore, they suggest an imbalance between the creatinine and urine output criteria. A third limitation of RIFLE is that the creatinine/GFR criterion is based on change from a baseline value, which is often not available. In this scenario, the ADQI recommends a creatinine estimation based on the Modification of Diet in Renal Disease (MDRD) formula, assuming a normal GFR of approximately 75 to 100 ml/min/1.73 m2 [6, 24, 32]. Although a very convenient and useful rule, it is not known how valid this assumption is. This is discussed further below. Fourth, investigators may be tempted to use the change in estimated GFR in place of the (true) GFR criterion, as some studies have already done [9, 10, 32]. This can be considered inherently incorrect since the MDRD equation, as with all GFR or creatinine clearance equations, is valid only in steady-state conditions [34, 35], and is certainly invalid in a situation where renal function is rapidly changing (that is, AKI) . In situations where the estimated GFR is used inappropriately, the derived conclusions could be misleading. Fifth, recent studies have shown that smaller changes in creatinine than those specified under class Risk, such as an absolute increase as small as 0.3 mg/dl, are associated with poor outcomes . Lastly, RIFLE does not take into consideration the nature or site of the kidney injury. The same could be said, however, for the consensus definitions for sepsis, acute lung injury, and acute respiratory distress syndrome [38, 39]. When no information on prior renal function is available, various studies use different ways to define the baseline creatinine – such as the creatinine at hospital admission, the creatinine at ICU admission, or the creatinine estimated from the MDRD formula as was suggested by the ADQI [6, 34]. In a retrospective study, E Hoste (personal communication, with permission) looked at the crude mortality in various RIFLE classes, using seven different options for baseline creatinine (Table 1). The mortality within each RIFLE category varied by as much as 7 to 13.9%, depending on which baseline creatinine was used; nonetheless, a stepwise progression was still seen going from Risk to Injury to Failure. Adapted from E Hoste (personal communication, with permission) and . ICU, intensive care unit; MDRD, Modification of Diet in Renal Disease. Zappitelli and colleagues also addressed the same issue in a pediatric population, using the modified pediatric RIFLE classification . As criteria, the pediatric RIFLE classification uses changes in the estimated creatinine clearance by the Schwartz formula . In their study, some patients had a known baseline creatinine while 41 patients did not . In this latter group, the authors looked at five different possibilities for baseline creatinine (Table 1). The choice of baseline creatinine had a marked effect on the prevalence of AKI. Depending on which baseline creatinine was used, AKI prevalence could be as low as 12.2% or as high as 82.9% among pediatric ICU patients. In a noncritically ill group of patients, the estimated prevalence ranged from 4.6 to 43.1%. Furthermore, in the subgroup in which information on prior renal function was available, these five options for estimated baseline creatinine varied by 0 to 67% from the true baseline value . This variation should be taken into consideration when reading and interpreting the literature, as this may have an effect on the accuracy of estimates of prevalence, incidence, risk ratios, and so forth. More importantly, it is crucial for investigators to make every effort to find and use a true baseline creatinine before resorting to the use of estimates based on various equations, particularly since chronic kidney disease is a key risk factor for AKI. Studies evaluating the validity of use of estimated baseline creatinine, whether from the MDRD formula or other equations, are needed. To extend consensus to scientific societies and healthcare organizations, the AKIN was created. A number of national and international societies of nephrology and critical care endorsed this initiative. One of the tasks of AKIN was further refinement of the AKI definition. In 2007 a modified version of the RIFLE classification was published, also known as the AKIN classification (Figure 1 and Table 2) . Four modifications are readily recognized: Risk, Injury, and Failure have been replaced with Stages 1, 2 and 3, respectively; an absolute increase in creatinine of at least 0.3 mg/dl has been added to Stage 1; patients starting RRT are automatically classified as Stage 3, regardless of their creatinine and urine output; and the outcome categories Loss and Endstage renal disease have been eliminated. Diagnostic criteria to be used only "after an optimal state of hydration has been achieved"
aAlthough the diagnosis of acute kidney injury is based on changes over the course of 48 hours, staging occurs over a slightly longer timeframe. One week was the timeframe proposed by the Acute Dialysis Quality Initiative group . Some finer points, however, may be overlooked. First, AKIN recommends 'exclusion of urinary tract obstructions or ... easily reversible causes of decreased urine output' and application of the diagnostic criteria '... following adequate resuscitation when applicable' . This modification is intended to exclude transient changes in creatinine or urine output due to volume depletion or other easily reversible causes, and addresses to some extent RIFLE's inability to exclude pre-renal azotemia. On the other hand, these factors are virtually impossible to verify in retrospective studies, and the concept of adequacy of resuscitation is highly variable among practitioners. Although one might argue that the AKIN criteria are intended to be used prospectively, one must also recognize that the vast majority who sought to or will seek to validate AKIN – or any AKI definition, for that matter – were and will be retrospective studies, as has occurred with RIFLE. Interestingly, a small retrospective study attempted to evaluate this component of AKIN . The authors concluded that the association of AKI with inhospital mortality was still significant even when the appropriate fluid challenge requirement is discarded. A second crucial, and perhaps under-recognized, difference between RIFLE and AKIN is the 48-hour timeframe within which the diagnosis of AKI is made (Table 2) . How this timeframe would be applied in patients in whom at least every-other-day creatinine values are not available, such as patients in the hospital wards, is not clear. This uncertainty is demonstrated by a pediatric study comparing RIFLE and AKIN . The authors state 'AKIN criteria ... change in creatinine should occur within 48 h. Because creatinine was not drawn daily in our non-critically ill group, we did not include this requirement'. Third, although diagnosis of AKI is based on changes over the course of 48 hours, staging occurs over a slightly longer timeframe (Table 2). Finally, the GFR criteria have been eliminated, which helps to discourage the incorrect use of changes in the estimated GFR for AKI diagnosis , as has been mentioned above. Yet another important concept in AKIN is the use of a reference creatinine for the diagnosis of AKI. A diagnosis of AKI is made on the basis of two serum creatinine values within a 48-hour period. This would circumvent the problem of not knowing the patient's true baseline creatinine. The reference creatinine is the lowest creatinine within a 48-hour timeframe used to diagnose AKI [7, 42]. The differences between RIFLE and AKIN in classifying a patient are illustrated in the hypothetical example of a Caucasian male, whose baseline creatinine is not known but is estimated at 1.0 mg/dl, with a slow increase in creatinine in the ICU of 0.1 mg/dl/day (Table 3). RIFLE and AKIN categories based on serum creatinine are shown for each ICU day. Between days 1 and 16, at no point was there an increase in creatinine of at least 0.3 mg/dl within a 48-hour timeframe. Based on AKIN criteria, the patient would not be diagnosed as AKI until day 17. At this point, the reference creatinine would be the lower of the creatinine values in the two previous days (that is, 2.4 mg/dl), and this is the creatinine value used to stage the patient's AKI. As demonstrated, the difference may be quite striking. aA 65-year-old white male, baseline creatinine not known but estimated at 1.0 mg/dl with the Modification of Diet in Renal Disease formula, admitted to the intensive care unit (ICU). AKI, acute kidney injury. At least eight studies have used the AKIN classification [16, 18, 30, 41, 43–46], including that by Ostermann and Chang recently published in Critical Care . The largest of these studies is a retrospective reanalysis of the Australia and New Zealand Intensive Care Society database , which compared RIFLE and AKIN on the first ICU day only. Estimates of prevalence and crude mortality were very similar between the two classification schemes. The authors concluded that, 'Compared to the RIFLE criteria, the AKIN criteria do not materially improve the sensitivity, robustness and predictive ability of the definition and classification of AKI in the first 24 h after admission to ICU' . This study, however, has some limitations. As with all retrospective studies, urine output criteria were not used as they were intended to be used. Only 24-hour urine output was available, and patient weights were not known. Although the authors attempted to modify the criteria (in a 24-hour period: Risk, <35 ml/hour; Injury, <21 ml/hour; and Failure, <4 ml/hour) , these estimates were ultraconservative. In fact, a 70 kg man with a 24-hour urine output <21 ml/hour in this study would have a 24-hour urine output <0.3 ml/kg/hour. Such a patient would technically qualify for Failure/Stage 3, rather than Injury/Stage 2. More importantly, this study looks only at the first ICU day; therefore, the 48-hour timeframe of AKIN does not come into play at all. Perhaps this is not the optimal study design for accurately comparing the two classifications. 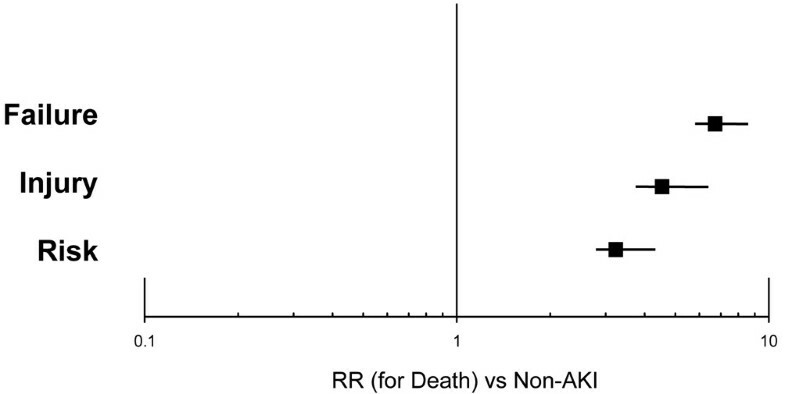 Nevertheless, this study raises some interesting points: would estimates of AKI prevalence differ between RIFLE and AKIN when we look at late AKI (that is, after the first ICU day)? If so, would the relationships between clinical outcome (for example, mortality) and AKI stages/classes change? A retrospective study looking at the first 72 hours of ICU admission showed a higher prevalence of AKI with RIFLE compared with AKIN . The authors noted a stepwise increase in mortality going from Risk to Injury to Failure (29.6%, 32.4% and 42.2%, respectively). In contrast, mortality rates were 34.7%, 29.2% and 40.6% for Stage 1, Stage 2 and Stage 3, respectively. In a small retrospective single-center study, the authors concluded that AKIN does not seem to improve on the ability of the RIFLE criteria in predicting hospital mortality of critically ill patients . The largest study to look at patients during their entire ICU stay is a retrospective reanalysis of 22,303 patients in the Riyadh Intensive Care Program database . Like most retrospective studies, the investigators were unable to use the urine output criteria of AKIN. Although the published AKIN criteria specify 'an absolute increase of ≥ 0.3 mg/dl' within 48 hours, the authors applied the criteria 'without specifying the direction of change'; that is, they classified patients with falling creatinine values as having AKI as well. This adjustment of the AKIN criteria is certainly compatible with clinical judgment. In their analysis, only AKI Stage 3 was an independent risk factor for ICU mortality. Surprisingly, AKI Stage 1 appeared to have a protective effect (odds ratio = 0.8, 95% confidence interval = 0.73 to 0.91). The authors concluded that the 48-hour window for AKI diagnosis may miss patients with a slow but significant decline in renal function. Furthermore, they hypothesize that using RRT as a criterion for Stage 3 may have a confounding effect on the predictive power of the classification. These issues remain to be resolved by further, ideally prospective, studies using both creatinine and urine output criteria. The AKIN criteria have partially addressed some issues with RIFLE. First, as mentioned, the elimination of the GFR criterion reduces variation in use of the criteria. Second, the negative prognostic value of smaller changes in creatinine has been recognized . Third, although the classification still does not define the nature of renal injury, some attempt has been made to exclude easily reversible causes of azotemia (for example, from volume depletion or urinary obstruction) from being classified as AKI. Other limitations similar to RIFLE remain, however: the fact that an AKI diagnosis based on clinical parameters can be considered pathophysiologically late, and issues related to the urine output criterion, among others. In addition to these, users of the definition may be confused about the correct use of the reference creatinine, the 48-hour timeframe (for AKI diagnosis) and the 1-week timeframe (for AKI staging) (Table 2) . There may be difficulty applying these criteria to patients without daily (or at least every-other-day) creatinine measurements , or to those who are admitted with a high creatinine that then decreases. Although we would clinically recognize such a patient as being admitted with resolving AKI, technically in such a patient there would be no 'abrupt (within 48 hour) reduction in kidney function' on which to base the AKI diagnosis. As suggested by the Riyadh study, the published AKIN criteria also could potentially miss patients with slow but significant increases in creatinine . Owing to a lack of universal guidelines for RRT initiation, it is at present a very subjective decision. Using RRT as a criterion for AKI staging may therefore have resulted in an unforeseen confounding effect. Altogether the cynic may consider these issues as semantics – these seemingly minor technical points may be significant in terms of reported epidemiology of AKI, as well as coding practices for reimbursement. The essential components of a workable consensus definition are that the definition should clearly establish the presence or absence of the disease, must give an idea of the severity of the disease, should correlate disease severity with outcome, and, most importantly, should be easy to understand and apply in a variety of clinical and research settings. In recent years, the use of the consensus definitions of AKI (RIFLE and AKIN) in the literature has increased substantially. This increase indicates a highly encouraging acceptance by the medical community of a unifying definition for AKI. This is a very important and positive step in the right direction. There remains some variation in how the criteria are interpreted and used in the literature, including use/nonuse of the urine output criterion, use of the change in the estimated GFR rather than the change in creatinine, and the choice of baseline creatinine. Future studies evaluating AKI criteria should ideally be prospective in order to improve the quality of data collection and to assess ease of use. Some of these studies could address the utility of such classifications for guiding clinicians regarding different interventions of AKI therapy. One example would be the timing of RRT initiation. While in the past the timing was mostly described by qualitative criteria (early versus late), AKIN has proposed that the RIFLE/AKIN criteria may provide the possibility of a more quantitative characterization of timing . It is imperative to recognize that no single definition will be perfect. A logical next step would be to reconcile existing definitions, moving the medical community towards using a single consensus definition as has been done with sepsis and acute lung injury/acute respiratory distress syndrome. Proposed enhancements would include retaining the minimum absolute change of ≥ 0.3 mg/dl, but would include both an abrupt increase and a decrease in serum creatinine, use of a timeframe longer than 48 hours for AKI diagnosis to avoid missing patients with slow but significant increases in creatinine, and using the same timeframe for both diagnosis and staging of AKI to avoid potential confusion, among others. As new data emerge, integration of novel biomarkers into the consensus definition will be a welcome refinement. In summary, all of these considerations remain in favor of a new and definitive ecumenic definition/classification of AKI. The time for "i-RIFLE" (improved-RIFLE) has come. The present review indicates that use of the consensus definitions of AKI (RIFLE and AKIN) in the literature has increased substantially, indicating a highly encouraging acceptance by the medical community of a unifying definition. AKI diagnosed using either classification, however, is associated with poor clinical outcome. A worse RIFLE class is associated with higher mortality, and with a longer ICU stay or hospital stay. There is some variation in how the consensus criteria are interpreted and used in the literature, including use/nonuse of the urine output criterion, use of the change in the estimated GFR rather than the change in creatinine, and the choice of baseline creatinine. A logical next step would be to reconcile existing definitions, moving the medical community towards using a single consensus definition that can be easily and uniformly applied. All authors have participated in ADQI workgroups. CR has participated in AKIN workgroups.